As a union of 14,000 resident physicians, we suffer from acute repercussions of President Trump’s actions on immigration on many fronts. They are not merely matters of security and law enforcement. Their effects are wide-ranging and endanger the public’s health, the healthcare safety-net, the wellbeing of physicians who are immigrants, and the fabric of our communities. Many of our resident physician colleagues made great sacrifices and moved to the United States to be of service to our patients and our communities. Among our members are brilliant scientists, asylum-seekers, and refugees from environmental disasters and war. These are the faces of immigration in America, and they are saving lives every day. Each of us took an oath of service, and we are in this profession to heal the survivors of violence and trauma, and those afflicted by illness. We are committed to providing healthcare to all, and treating each patient with dignity and respect, regardless of where they come from. This is an American value and does not change with a new administration in Washington. Those American values are at odds with President Trump’s actions. The executive actions will intensify criminalization of immigrants, pull local law enforcement into his “deportation force,” endanger safe havens, and tear communities apart. It will cause patients in dire need to shun local hospitals and clinics where a police officer is stationed out of fear for themselves or their families, turn a trip overseas for a foreign-born physician into a nightmare of uncertainty, and threaten to withdraw millions of critically-needed and properly allocated federal healthcare dollars from our cities, counties, and states. Simply put, lives will be put at risk by these actions. To receive alerts on this issue and find out how to take action, join our rapid response team. We Stand United. America Needs Union Jobs. 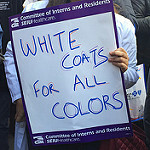 The Committee of Interns and Residents is the oldest and largest housestaff union in the country, representing more than 15,000 interns, residents, and fellows in California, Florida, Massachusetts, New Jersey, New Mexico, New York, and Washington, D.C.